This full-page advertisement was on the back cover of the January 1980 issue1 of Fantastic Films, a science-fiction and fantasy magazine that published 46 issues between 1978 and 1985. The text states: "Now you can see almost 8 minutes of exciting scenes from STAR WARS in a specially condensed Super-8 version. All the visual splendor, the ships, effects, space battles, the heroes and villains of one of the finest Science Fiction films ever made." The cost was $8.95 for the black-and-white2 silent version, $17.95 for the color silent version and $29.95 for the color and sound version. Interestingly, the Super 8 versions of "Star Wars" (pictured at right) still in existence aren't as valuable as you might think they'd be in the collectors' marketplace. A quick glance on eBay shows that copies can be had for less than $20. Of course, in 1980 it was a novel concept that you'd be able to watch a portion of Star Wars at your own leisure and on your own schedule3. This was before the days of owning films on VHS, DVD, Blu-ray and other formats4. 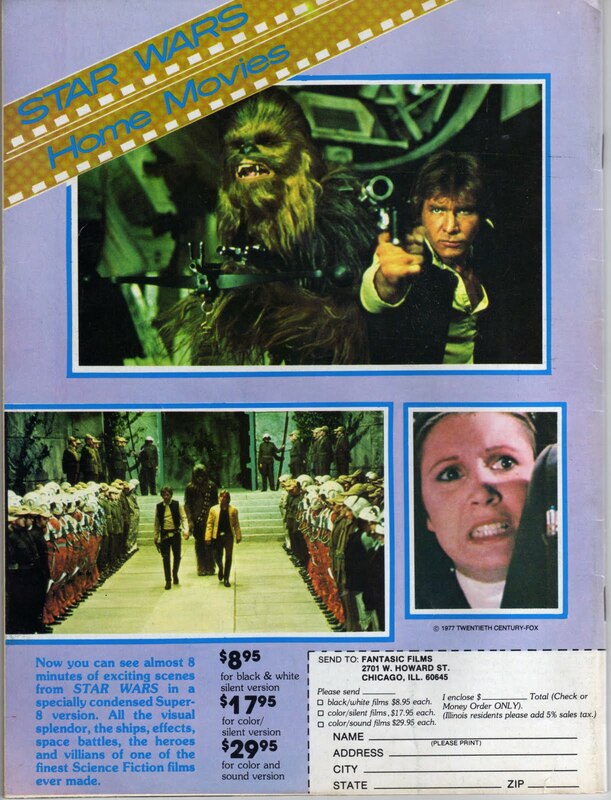 As a 9-year-old living in Clayton, New Jersey, in 1980, I was more interested in Star Wars figures and their mail-in offers than acquiring a Super 8 home movie. I remember how excited I was when I finally had enough proofs-of-purchase from action-figure boxes to send away to Kenner for the Action Display Stand. I couldn't wait! It was going to be so cool! It promised to be a great way for me to display and MOVE my Star Wars figures for "added play value" in front of a "realistic backdrop"!! Well, I could always just take Darth Vader, Chewbacca and Greedo outside in the fresh air and throw them off the front porch some more. 1. The issue includes articles on the Sean Connery/Natalie Wood flop "Meteor", Eiji Tsuburaya's work creating Godzilla, John Badham's version of Dracula, and an interesting look at how robots were presented in science-fiction serials of the 1930s, 1940s and 1950s. 2. Picturing "Star Wars" in black-and-white reminded me of the brilliance that is this. 3. One thing you did have control over was this: If you watched the end credits for "That's Hollywood", narrated by Tom Bosley, you could see the Death Star explode in your own living room at the same time each week. 4. 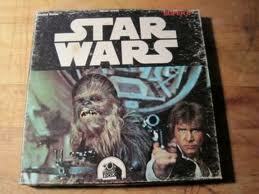 The "Star Wars" films have been issued and re-issued in countless editions and special editions. Up next: A Blu-ray box set in Fall 2011 and 3-D versions of the films starting sometime in 2012.